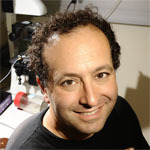 Greg Lang and David Botstein have a paper in PLoS One this week probing the consequences of disrupting the cluster of GAL genes in the yeast genome. Notebook S1. The complete laboratory notebook detailing the strain constructions and experiments presented in this study. It’s really not so amazing that they did this. It’s actually a totally obvious and natural thing to scan and post an entire lab notebook as supplemental material – in principle allowing anyone to answer virtually any question they have about the actual work conducted. What is amazing is that – as far as I know – this is the first time anyone’s actually done it. And (members of my lab take note) this will not be the last. Way to go Greg and David! 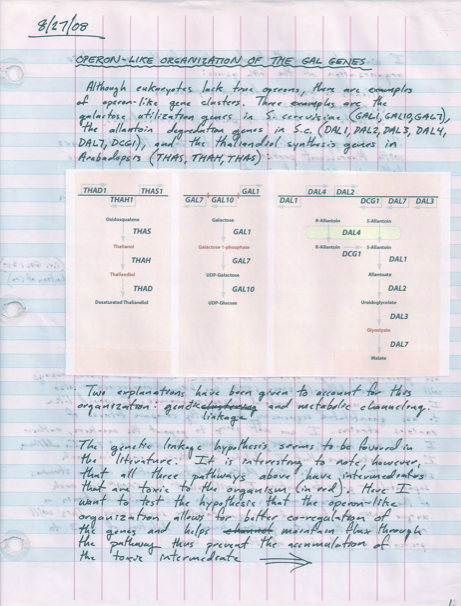 I’d have to tone down the language in my lab notebook, especially around areas depicting failed pcr, sequencing, mistakes resulting from carelessness, etc… Agree though, why havent people been doing this?? @Matt: it does look to me (just from that one page) as though the notebook was kept with publication in mind. No page from any notebook I ever kept looks that neat and organized, to say nothing of the absence of foul language. It’s an interesting question: when you decide in advance that the world will see your notes, to what degree does the internal self-censor activate? Does it provide motivation to keep better notes, with clearer expositions of your thinking and better handwriting and less cussing? Does it also provoke thoughts like “nah, that idea will look silly, I won’t write that down”? Bill: totally agree. I wondered if the notebook was re-written after the fact for the purpose of publication.. Full sentences and articulate presentation of ideas have never really been a part of any of my lab notebooks. Agree re: self censorship.. This is actually the fifth notebook that I have scanned as a companion to a published paper. Previously I have been hosting them on my website and publishing a link in the Methods section. It was recently suggested to me that I should submit my notebooks as Supplementary Material—this PLoS ONE submission was the first occasion to do so. Knowing that everyone will have access to my notebooks is a strong motivator to be thorough in my record keeping. All of my scanned notebooks are originals and they are certainly not devoid of mistakes, misspellings, and (occasionally) profanity. I really, really like this, and I hope that more people will follow, not just when it comes to biology (I’d love to make this happen for my next psychology project).